President Trump believes that if you give more money to big corporations and billionaires that money will trickle down to you..."
Let us analyze the rhetoric of these amazing sentences carefully. "I'm an actual economist (MIT PhD degree shown)"
This is an argument by authority, by credentialism. He, Austan, has a PhD from a Big Name institution. What follows is therefore a result of that special knowledge, that special insight, that special training, that actual economists have. He doesn't have to offer logic or fact, which you won't understand, and you aren't allowed to argue back with logic or fact, unless perhaps you too have a Big Name PhD. What follows isn't just going to be Austan's personal opinions, it inherits the aura of the whole discipline. By implication, anyone who disagrees isn't an "actual economist." "Donald Trump's tax plan is a scam"
This are the most interesting 7 words. It is not, in fact, "Donald Trump's" tax plan. It is, clearly, a tax plan hashed out by Republicans in Congress, with some input from the administration, mostly the Treasury department. Almost nothing in this comes form Donald Trump. Just how many nights was President Trump up late on his laptop sweating over the income and depreciation limits of pass-through income deductions? Not many, I'd wager. So why is Austan calling it "Donald Trump's tax plan," not (say) "Congressional Republican's tax plan?" Once you ask, I think it's obvious. President Trump is a reviled figure in the audience that Austan is aiming his video at. So personalizing it, wrapping policy up in Trump's personality, loading the actions of our complex political system into the actions of one person, though it manifestly is nothing of the sort, serves an obvious rhetorical purpose. Hate Trump, hate the plan. It is the first of many dog-whistles. "Scam" is the single most interesting word. 1. a dishonest scheme; a fraud. "an insurance scam." synonyms: fraud, swindle, fraudulent scheme, racket, trick; pharming; informalcon, hustle, flimflam, bunco, grift, gyp, shakedown. "the scam involved a series of bogus investment deals"
Now, detecting "scams" is not the sort of thing that Real Economists are trained to do. We can analyze incentive effects and distribution tables, spot budget constraints, and argue over deficits and economic growth effects. But "scam" is an accusation that the intentions of those writing the tax bill are malign. Just how does Herr Prof. Dr. Austan Goolsbee, "real economist," know anything at all about the intentions behind the tax bill? To say nothing of (now that he personalized it) Donald Trump's intentions? 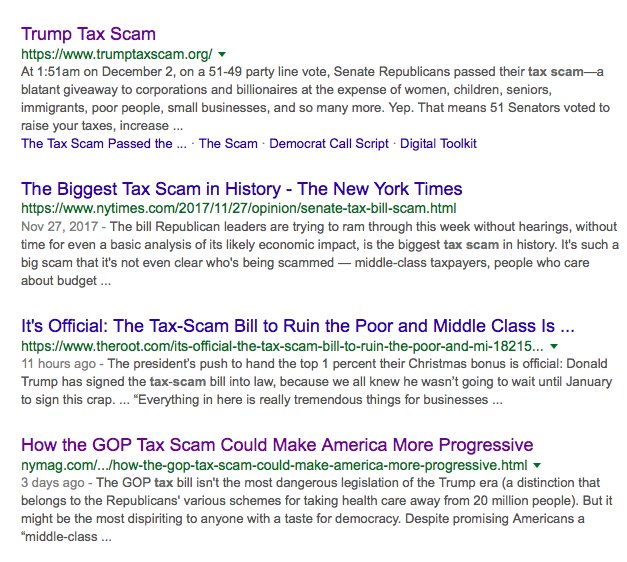 A quick google search reveals a whole website devoted to "GOP tax scam," and its many echoes in the political media. So this is not clever Austan rhetoric. Austan is repeating a well-orchestrated bit of democratic party spin, talking point, or propaganda. It's the second dog-whistle. Political parties do this. They search for some phrase that catches the ear. They aim primarily to marshal moral outrage and demonize the political opposition. Hence "scam" not "distorted incentives" or "misplaced priorties" [growth vs. redistribution]. The phrases are fairly meaningless. But if you repeat them over and over again, they start to get meaning and energize the base. Really, Austan? Is this the best you can do? Is the role of public intellectuals and "real economists" to assert their intellectual superiority by their credentials, and then to repeat whatever buzzword their chosen political party is pushing these days, be it "tax cuts for the rich" "make america great again" or ,"tax scam?" 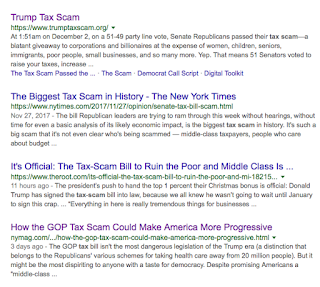 "Tax scam" is particularly loathsome for an honest intellectual as it is useful as partisan rhetoric. It does not appeal to any actual analysis of the tax code, or the troublesome fact that Obama himself wanted to cut corporate taxes, and ran a few dollars of deficit along the way. Instead it just attacks the motivations of the other side. And then people like Austan complain of partisanship. "This tax cut was designed to help Johnny Marshmallow" (Billionaire, with monopoly man image)"
This is a flat out ... untruth. I'm trying to be polite. Perhaps Austan's analysis of the general equilibrium burden of taxation reveals that in the end Johnny Marshmallow gets a better deal out of it than Joe Working Stiff. But it is simply untrue that the tax cut was designed to that purpose. The clear design was to lower the cost of capital, thereby increase investment, and thereby raise productivity and wages. This is the clear public statements of the designers. We can argue whether it will work as designed. But if you're going to attack motivations you have to deal with the constantly repeated statements of the designers, and the absence of any evidence for the contrary view. "Real Economists" have no special training in journalistic or historical analysis, for assembling evidence on intentions. And it shows. "President Trump believes that if you give more money to big corporations and billionaires that money will trickle down to you..."
Again, here is a statement of a fact, by a PhD academic, with not a whiff of evidence. Just where in the MIT PhD program do they train you to make statements of fact with no evidence? How does Austan know what President Trump "believes?" "Trickle down" is another dog-whistle calumny, another bit of rhetorical propaganda, another deliberate placing of evil words in an opponent's mouth, another big lie (let's be frank about it) that Austan and company hope that by passing around over and over again will become truth. I would be very interested to see any quote from anyone who worked on this tax bill advocating that it will work by "trickle down." The argument for it is that it works by incentives. A better prospective rate of return gives companies a better reason to invest. Period. "Trickle down" is a pejorative version of Keynesian economics, not of incentive economics. It was invented by critics of tax reform. will also mean higher deficits and capital costs, it will likely crowd out as much private investment as it stimulates. His "10,000 people will die!" attracted a lot of attention. Perhaps something about Trump's style causes people to become unhinged. But it does not escape notice when economic analysis changes sharply the minute after an election, and I think Larry lost a lot of his reputation for economics-based analysis. Alan Blinder, in an amazingly weak attack on the tax bill in the WSJ did a better job. Why do I say weak? Tot up Alan's arguments: 1) Republican senators and representatives overdid their back-slapping and Trump-congratulation at the signing ceremony. 2) Trump was wrong to claim it's the biggest cut in history. Reagan and Bush were bigger. 3) The new tax bill, like the old one, is full of special provisions and deductions. 4) The personal tax cuts expire, to fill budget rules, unless congress extends them. 5) it raises the deficit 6) The process wasn't open enough 7) a revenue neutral, distribution-neutral, broaden the base, cut the rates reform like 1986 -- and like the one Paul Ryan started out with before it went through the congressional sausage machine -- would have been better. Alan repeated the "trickle down" calumny, and like Larry his concern about the deficit is a bit of a sudden conversion. But other than that, he makes a good honest effort with a weak hand. I agree with 3 and 7, and don't think it's my job to comment on 1, 2, 4, and 6. But that it could have been better seems a weak argument for throw it all out. This all builds up to some positive thoughts. What is a good role for policy-engaged economists, or even economists who want to transcend institutional boundaries and become public intellectuals? What are some useful rules to follow? Usually, "actual economics" finds little of value in either political party's propaganda. Echoing that propaganda is a sure sign of empty analysis, so avoid it. "mindless whacked-out rhetoric" is spot on -- and a spot on characterization of what Austan offered in place of actual economics. A little better or a little worse is a good frame for analyzing any policy proposal. Actual economics is most delightful because it offers answers outside of the usual morality play. Focus on incentives, not who gets what out of the tax code. Point out the missing budget constraint. Notice that the behavior you deplore is a rational response to a misguided incentive, not a sign of evil. Politics thrives on demonization. But it is a fact, which people who have tasted Washington like Summers and Goolsbee have done should know better than the rest of us, that the vast majority of people in public life are good people, and have the same goals. Democrats and Republicans, even many from the outer fringes of the parties, fundamentally want a better life for all Americans, and prioritize those in tough circumstances more than others. They disagree, and deeply, about cause and effect mechanisms to reach that common goal. It is not good politics to point this out, nor good for advancing one's particular solution to a problem through the political process. But it is much better policy analysis, and much better scholarship to acknowledge the truth. Don't play politician. You're trained to be an economist, not a politician. Ed Lazear tells a good story of once offering political advice to President Bush, and being quickly shut down. Bush told him to give the best possible economic analysis and leave the politics to Bush. Now, one can make some room for economists actually working in the government. A treasury secretary must, once the internal give and take is over, sell the imperfect product. But that can mostly be done with creative silence, and does not extend to parroting propaganda. Economists who used to work in government, and presumably wish to return also must to some extent show they are part of the team. But articulate, analytical and a bit one-sided support need not dip to propaganda and demonization. And our political system could do with a little more self-restraint, politeness, abstention from calumnies and demonization too. Obviously, bending over backwards to point out deficiencies on both sides of the partisan divide, and good things on the other side, when one can, is useful to establish some credibility. Doing otherwise also further tarnishes the brand name of economics, and academia, and science in general. When Austan wraps his political dog-whistles in "I'm an Actual Economist" and shows his PhD, honest citizens don't so much update the deep truth of democratic party propaganda, they update on what academic credentials mean, and what academic research and analysis is. No, 99% of us are not here to scream one party's talking points are the utter truth, and the others scheming evildoers. It does more than tarnish some vague reputation of "actual economists" (I may be kidding myself that we have much!) Austan's employer is a non-partisan, non-profit, explicitly forbidden to engage in political activity as a condition of receiving tax-deductible gifts, to operate as a non-profit, and to receive federal funds. The reputation if not the tax status of academia is in question. Universities are widely perceived, and not altogether incorrectly, as hotbeds of partisan political activism. Congress is waking up, and the tax bill also started to rein in our privileges. While faculty are entitled to our opinions, and to express them, and to engage as private citizens in political activity, and to speak as we wish, when we drag our professions in, the response is natural. If Austan had merely started "Hi, I'm an actual ex-Democratic administration official, hopeful to get a new and better job in the next Democratic presidency, and ..." I would have little objection at all. Ad-hominem attacks, attacks on an an intellectual opponent's motivation, especially with no documented evidence at all for that attack, used to be strictly out of bounds for "actual economists," and scholars in general. In fact, productive discussion is usually enhanced when one ignores motivations that are there and documentable. It's better to win on logic and fact and ignore motivation. Contrariwise, when you see an argument by motivation, which Austan made three times in as many sentences, you should infer that the arguer has neither fact nor logic to offer. That agreement not to impugn motives is the only hope for a productive conversation, either in academia or in politics. Once you say "scam," that's over. In person, Austan has always been an exemplary person to debate public policy with. He supports his arguments with logic and fact, and displays a deep command of the economics literature. "Now wait a minute there John, there was this study in the QJE last year that showed...." and I would have to humbly say "Hmm, I'll have to read that." Unlike many other economists, he never shot back easy talking points, party propaganda, or arguments by motives. In part, I guess, the contrast between the private and public Austan got me so grumpy in this post. I don't bother to criticize Paul Krugman or Brad DeLong for far worse sins. Larry Summers writes, objecting to my statement "advocate for democratic party causes." Larry points, correctly, to his support for Glass Stegall repeal, his efforts to reform GSEs, his support for the Keystone pipeline, tort reform, regulatory streamlining, against single payer health insurance, and for trade agreements. I add that Larry has suffered pretty harsh criticism from people in the democratic party for these positions. Dr. Cochrane, I wish economists were less partial in their public statements as well, but does listing Dr. Blinder's arguments and calling them weak amount to a real refutation? It doesn't even seem to be an argument. The weakness of Blinder's attack is self-evident; no *argument* is called for. As I noted here previously, Goolsbee, in his best faux "ah shucks" impersonation, turned the Office of the CEA into a cheap political sales show. This is just more of the same. This sort of thing does a real disservice to your profession and the role of economists generally in objectively giving policy advice. After watching the video, it's even worse than I expected. I don't even know where to start. Goolsbee laments the fact that the bottom 20% of the income distribution will supposedly only see their income taxes reduced by $50. Of course this ignores the fact that this group already pays a negative income tax rate. Even if we look at all federal taxes, the bottom quintile's average rate has dropped from over 9% in the mid 1980's to 3.3% in 2013 according to the latest CBO numbers. Just how much of any future tax cut does he expect to go to this group? Then there's also the fact that he apparently wants viewers to think this statistic for the bottom 20% of the income distribution during a given year represents how much "you," "working moms" etc will be affected by this tax bill. Obviously the typical middle income household will see a much larger benefit. The usual "trickle down" straw man. Deriding tax cuts for corporations without at least explaining to us who he thinks the incidence of this tax falls on. I'm also curious as to what he's referring to when he talks about teachers losing their benefits. If 'trickle-down' was a myth, how else could unskilled workers today be so much wealthier than unskilled workers 50 or 100 years ago? Their relative prosperity is merely due to the luck of existing in a world with capital that was and is mainly owned by wealthy people. Awesomely awesome, if I may say so. Thank you for writing this. The term seems to have "caught fire" with the news media since then, particularly in the wake of the tax bill's passage in the house and senate. Great post! Austan should be ashamed of himself, and being an MIT economist (like myself) he probably is, now that you've called him out on it. It's OK to use the credential. It serves to tell the reader that probably the rest of what you;re saying is worth reading--- quite aside from whether it is authoritative. But of course in this case, as you explain, the rest of what he says turns out not to be any better than a Democrat talking point. Trump mania rules again. The Republican tax cut (you're right: Trump shoudl get neither credit nor blame) is a straightforward business tax cut. Maybe that's good, maybe that's bad, but it's not a scam and it's not concealed; it's really obvious. To be sure, it also contains other tax cuts for lower-income people, and those are small in absolute terms, big in relative, since those people pay so litle to begin with. And it's political payback against rich people in New York and California, but that's how the election cookie crumbles. They gave money to Hillary, and she lost, so now they lose their giant state tax deductions and their colleges have to pay a little bit extra tax. By the way, what does Paul Krugman think of the Keynesian deficit spending, the $1.5 trillion extra? Does he think that's a good thing now, or is it too little, too late? I suppose since he thinks Trump will throw us into recession, he should like there to be as much deficit spending as we can get. Austan seems like a Paul Krugman acolyte! Virtue signalling and all! As for trickle down, vis a vis supply side, offense should be taken by any devoted to rigorous scientific inquiry. The wealthy dine and we, the peasants, get the scraps falling from the banquet table? No Austan!!!! All boats rise with the tide!!! I believe Gary Cohn did seem to imply that "trickle down" was one of the benefits of the GOP plan. Or at least that's my reading of the below. "Harwood: If you look at the center of gravity of the economics profession, what they will say is that the deficit will go up more than you guys say, growth will increase less than you guys say, and that workers will get less than you guys are projecting. Cohn: We vehemently don't agree. When you take a corporate tax rate at 35 percent and move it to 20 percent, and you see what's happened over the last two decades to businesses migrating out of the United States, migrating profits out of the United States, migrating domicile out of the United States, and hiring workers out of the United States, it's hard for me to not imagine that they're not going to bring businesses back to the United States. We create wage inflation, which means the workers get paid more; the workers have more disposable income, the workers spend more. And we see the whole trickle-down through the economy, and that's good for the economy." Shameful, pathetic, ridiculous. Krugman disease is apparently contagious. Mood affiliation at its worst. The thrust of this bill -- the treatment of corporate income -- would have gathered multi-partisan consensus worldwide. Oh, wait, it already has, for years. Are myriad Progressive governments worldwide also scammers, water carriers for the rich, purveyors of death...Come on. I echo the plaudits of others on the excellence of this column. The most egregious sin was the display of credentials as an imprimatur. I know it's hard to call out wayward colleagues, but it is important to do so if our profession is to maintain credibility with the public. If we as economists are seen as partisan hacks, the whole profession suffers. Thank you for doing the hard, but right, thing. A great post that helps clarify the ideal standards of debate in the heated atmosphere of 2017. Economists should indeed know better and produce a public good by serving as "public intellectuals." Dan Drezner contrasts the former, who are skeptical and analytical, with "thought leaders," who are motivated by a single, simplifying idea (often funded by donations): https://newrepublic.com/article/143004/rise-thought-leader-how-superrich-funded-new-class-intellectual. We have economists - some of whom are Nobel winners - not producing a public good of rational, analytical discourse. You say it's not the job of economists to detect scams, because that requires knowing the intentions of economic actors, and that lies outside their purview. But one of the central tasks of economics, surely, is to identify incentives and the behaviour they elicit. How can we talk about people responding to incentives without making inferences about their intentions? If the price of widgets rises and I respond by buying fewer widgets, to identify my action as a response to incentives you have to form a hypothesis about my intentions (e.g. that I intended to economise, rather than that cut back for some other reason). Class analysis, public choice analysis -- these all require this kind of incentival analsyis. I've always agreed with Ludwig Lachmann's dictum: "Economics has two tasks. The first is to make the world intelligible in terms of human action and the pursuit of plans. The second is to trace the unintended consequences of such action." To identify something as a scam falls under the first task. This might be an overstatement: "the vast majority of people in public life are good people"; how about: "people in public life are, on average, of average virtue"? We do not disagree, as I find the fast majority of people in private life are good people too. What I find interesting is most of the provisions in the tax bill would have been supported by Obama if only another $4 trillion in revenue could have been found. As a tax lawyer, the word was always Obama would do tax reform, doing most of what the current bill did, he just would not do it on a revenue neutral basis; it had to raise revenue. While Obama would have keep the SALT because it favored dems, in each budget he proposed to eliminated the charitable deduction, which involves the same policy considerations. But it is good to call out Austan on his comments. While I do not like some provisions of bill, I think it clearly passes Peggy Noonan's test. When economists make statements such as Dr. Goolsbee's, and at times Drs. Summers and Krugman, I think it devalues the reputation of economists in general. Just for your edification trickle down economics is part of the supply side madness and has little to do with Keynesian economics. Paul Craig Roberts would be getting apoplectic!! Cutting tax automatically increases investment? Only if demand continues at the same levels or is thought to be higher. As for titles One cannot be Herr, Professor, Doctor. One never three. If a man is a professor of economics surely that would lead most people to believe he is indeed an economist. Maybe not in the land of Trump! It is not, in fact, "Obamacare." It is, clearly, the ACA hashed out by Democrats in Congress, with some input from the administration. Almost nothing in this comes from Obama. Just how many nights was President Obama up late on his laptop sweating over the details of bronze plans? Not many, I'd wager. So why is John calling it "Obamacare," not (say) "ACA?" Once you ask, I think it's obvious. President Obama is a reviled figure in the audience that John is aiming his post at. So personalizing it, wrapping policy up in Obama's personality, loading the actions of our complex political system into the actions of one person, though it manifestly is nothing of the sort, serves an obvious rhetorical purpose. Hate Obama, hate the plan. It is the first of many dog-whistles. Isn't a key distinction between John's (and many others') use of the term "Obamacare" versus those dubbing the new tax reform as some sort of "Trump Tax Scam" that the former term is not really pejorative at all whereas the latter "Trump Tax Scam" terminology is necessarily a slight at the piece of legislation itself? Even the link you posted seems to only contain discussion about the potential (or realized) consequences of Obamacare itself, but it doesn't seem to take any sort of disparaging cheap shot at the legislation with the nickname itself (you won't need to look far to find lots of people on the left and right of the political spectrum referring to the ACA as "Obamacare"). Also, as somewhat of a "moderate" who does not "revile" President Obama, I can't help but find your blanket statement about the aim of John's post baseless and incorrect. In general, this blog seems to attempt provide thought-provoking economic perspectives that are sometimes related to the current political issues, but I think the author of this blog takes more care than most in carefully selecting words to not be belittling or deprecating (aside from some good some self-deprecating humor sprinkled throughout the posts). Oh the trickle-down 'calumny'. Already Reagan's Budget director referred it as trickle down. So what? Because Cohn used “trickle-down” the rest is invalid? Come on now. News to the "me generation": mooching off babies doesn't make you self-reliant. Despite what Santa (i.e. Reagan) told you to get votes, racking up debt on your kids and grandkids so you can have a tax cut...make you a mooch. Generation X and Millennials didn't vote for this nonsense. Self-indulgent delusional Baby Boomers did. So many things to quibble with in this post. Here's one: You say it isn't "Donald Trump's plan" because Trump did not work out the details. That's like saying it isn't "Trump's tower" because Trump didn't do the wiring. But the tax bill has many provisions that seem designed specifically to increase Trump's personal wealth -- things for real estate moguls. It's the bill Trump got passed -- you pass it you own it. Question, why dont you mention supply side economics once? I'm not an MIT economist but, like Eric, I find Austan's performance deeply disturbing. He isn't a stupid man. The claim "this is trickle down economics" is not the claim "this reduces the taxes of rich people." It is the claim "this reduces the taxes of rich people on the theory that the money they save will somehow trickle down to less rich people." And the phrase is wrong in a different sense. Presumably Austan, being an economist, realizes that the actual incidence of a tax isn't defined by how hands over the money. A tax on rich doctors might be paid mostly by them if the demand for physicians' services is very elastic and the supply very inelastic, it might be paid mostly by their customers in the opposite situation. That point was recognized at least as early as the 18th century by Adam Smith. If Austan thinks that logic is correctly described by the metaphor of money trickling down he is not an economist. If he doesn't think so then what he said shows him to be a demagogue. But then, talking about giving more money "to big corporations" is enough to demonstrate that. "Big corporation" does not translate as "rich person"--the size of a corporation does not tell us how rich its stockholders are. Reducing corporate taxes might enrich stockholders, it might enrich workers, it might enrich customers, it probably effects all of them, and the effect does not depend on the size of the corporation. Austan's decision to produce and promote this type of video would be an excellent question on an intermediate microeconomics exam. First, there is clearly a demand for Austan's product and on multiple levels. There are opponents of tax reform or partisans who want material to use to convince less ideological voters that they will not benefit. Talking points from highly credentialed individuals that are simple and bold tend to be more persuasive than complex explanations of the effects of tax changes on economic behavior. If viewers can actually persuade others that this is detrimental or the benefits are non-existent, this can help increase the likelihood of political change in future elections, as middle-of-the-road voters shift away from GOP candidates. Viewer: "Trump is only for the rich. I watched this video of this MIT economist guy. He said the Trump Tax Plan is a total scam. He even showed how only the rich benefit using real numbers." Second, the other group that wants Austan's product is the elite political class. If Austan can demonstrate he is effective in reaching large numbers of voters and either energizing them or helping them to shift opinion, Austan could be well-rewarded in the future. He might be able to get a new government position or be invited on other talk shows. He basically figured out that the benefit is much larger to him (especially in the long-run) than these costs. What is really smart of Austan is that he figured out that he can mitigate the impact of these costs by being a "nice guy" when people point out the flaws in his arguments and approach. By acknowledging criticisms by saying they are "worth reading/considering" he reduces some of the loss of credibility within professional circles. By taking a pleasant tone and encouraging people to consider critiques of his work he has reduced the long-term costs of actions. This also makes it less likely that he'll get discredited among non-professional groups. That would make things harder though I suspect that Austan knows that in today's day and age being discredited isn't as bad as being boring (see Dr. Oz). The interesting question is will new economists emerge to take things even further in the rhetoric department. It may just be worth it to them!